First of all: we were on school. We've missed you, we've thougt about you while we were in that stupid *&%(*! classrooms. And then the second reason, the internet was gone for a few days. A few? let's say a week ;). Sooooooo, there's coming up some good stuff, and for now; take care of yourself. First of all: NEVER CUT YOUR CUTICLES! You can still buy them, they miserable cuticle ruiners. Cuticle scissors. Sometimes their on a cuticle pusher! :( Tough I'll ask you, PLEASE don't use them. 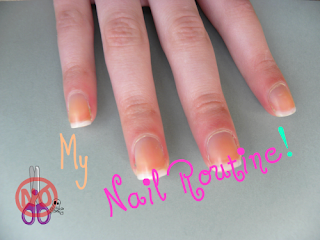 A nail routine is all about taking care of your nails. It's not just paint your nails and go on with your life (whooh it sounds like a drug addict hahaah), and if you do: your nails won't thank you for that. 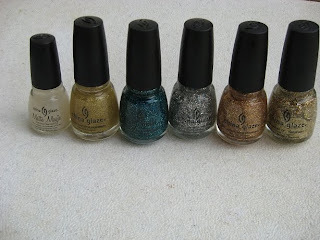 Get rid of you old nail polish. Use a aceton free remover. Rub Cuticle Oil into your cuticles (if you don't own any, use olive oil) and push back your cuticle. 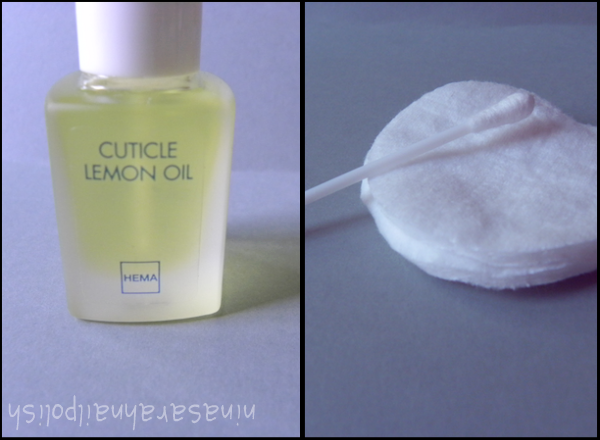 I use a cotton swab dipped in cuticle oil. Find out what works the best for you! 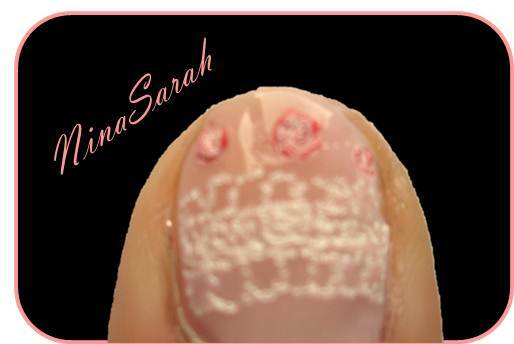 :D If there's some oil on you nails, remove this with nail polish remover on a cotton pad. Give your nail a perfect shape - I usually shape my nails square or squoval.You can also use a buff file to make your nails smooth and shiny. 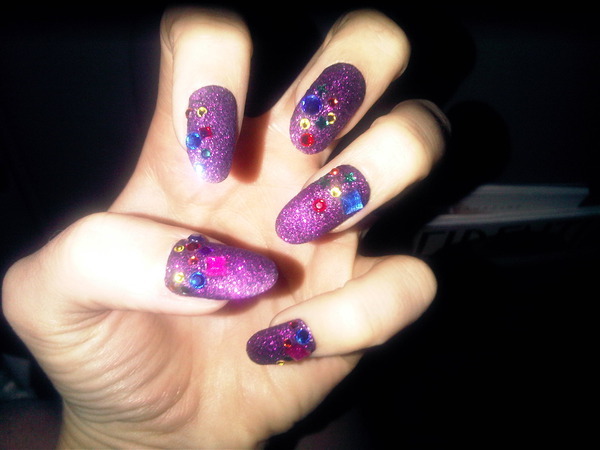 Apply a base coat or a nail hardener to protect and strengthen your nails. I like to use my selfmade garlic base coat. 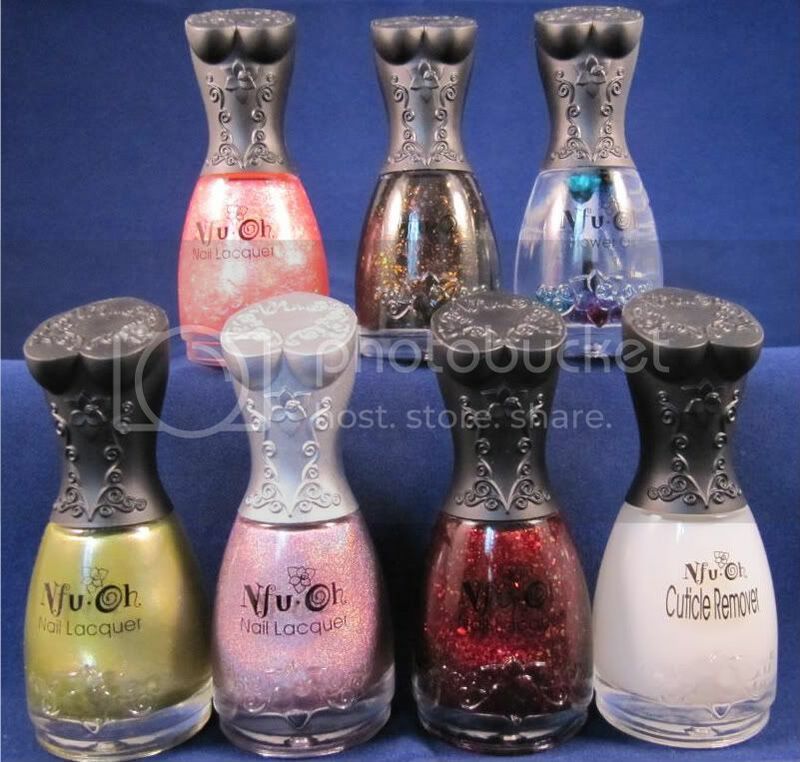 After this you can paint your nails in the color whatever your want :D! End with a good sealing quick dry blablablabla top coat. Ask me anything about nail polish, or whatever you want. I'm ready to answer! It's obvious she's a Minx-fan. Don't you just LOVE the Oompa-Loompa nails? 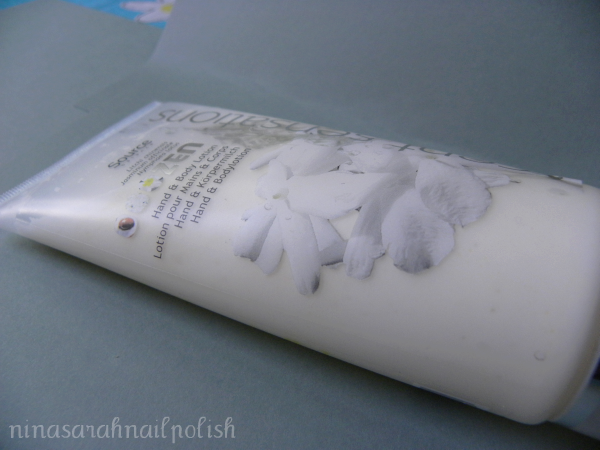 Giveaway @ The Lacquer Files, tadadadaaa. Today I'm going to show you how to create a beautiful flower on your nails without konad. I inspired this tutorial on an accident that I had with making a little cute flower on the top of my nail after that I wiped out one of the leafs I decided to do it on all of them and here is the result. The tutorial is divided in 8 steps for you without giving base- and topcoat a step because thats just a habitat. 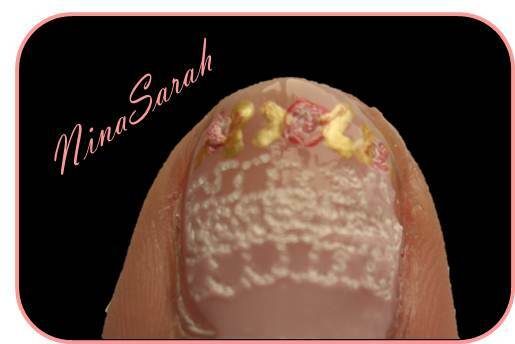 I painted this tutorial on the nails from my friend Iris, because my nails were still full of the Lacy Roses =P. Okay well let's start the tutorial! 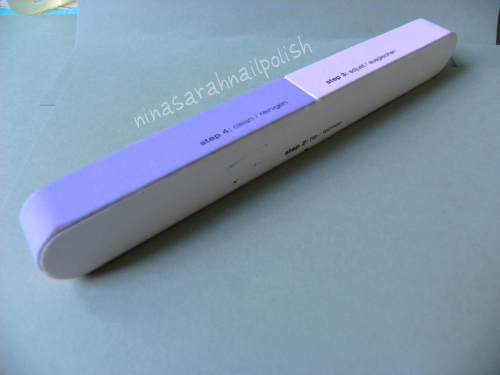 Paint your nails with a ivory coloured nailpolish (I used (735) Pearly Pink by Max Factor). You just need one layer because the background doesn't need to catch attention. With a toothpicker you have to go from the center of the white dot to the top of the upper purple drup, then go with the toothpicker from the center of the rests of the white dot to the end of the left purple drup and continue like this through the last three dots. When you have to less white you can add a very little drup. If it looks like my flowerlike wipe out on the left you can continue with step number 5. Now use your toothpicker again and to stripe the mess next to the leafs into the center so you get the effect from the picture on the left. 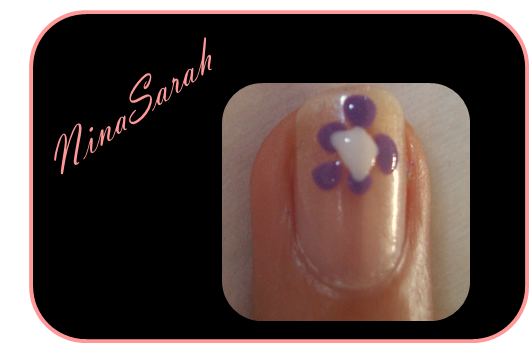 At last you make a little purple nailpolish (I used (541) Gasoline) dot by using a dotting tool in the center of the flower. 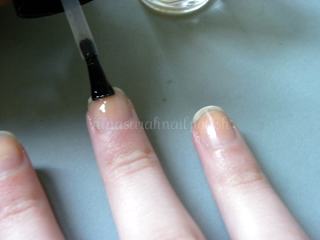 Now (after drying) all you need is a topcoat and your nails are done! This tutorial is inspired by a little gift I got from someone. 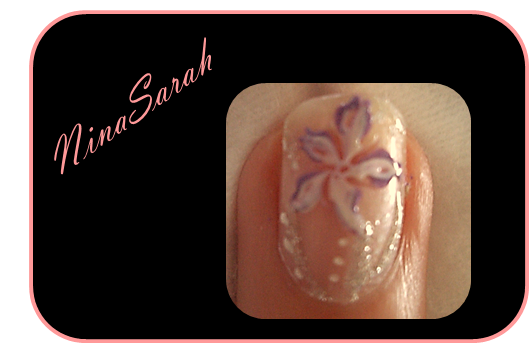 I thought it was a great nail art design and made a tutorial for you^^. I have divided this tutorial in six steps, so you can easily keep up (I haven't photographed my nails with base- and topcoat but you do need them in this tutorial). (After putting up your basecoat) paint your nails a cute light pink colour (I used (286)OysterPink by Rimmel London) and let it dry. When you have it all dried and egally spread over your nails, usually your second coat because light pink is mostly a very sheer colour, you can continue with step number two. Paint a stripe of white nailpolish (I used (02)White Secret by Essence) in the center of your nail, then by using a dottingtool make the stripe a little ''lacylike''. Make 3 little red dots using a dottingtool or just a little drup of nailpolish (I used (11) So Glamourous by Essence) at the top of your nail. 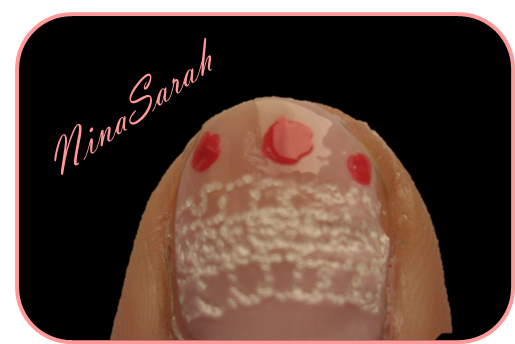 Make 3 little dots of white nailpolish on every red dot (I used (02)White Secret by Essence) and by using a toothstick mix the red with white. 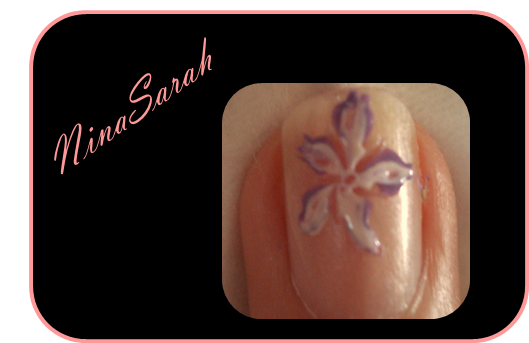 Make little with golden/green nailpolish and a dottingtool ''sidewayshartslikeleafs'' =P next to every rose (I used Shade No. 26 by 2true). When it has dried you can use a topcoat. We're so sorry - this blog was kinda dead for a few days, wasn't it? 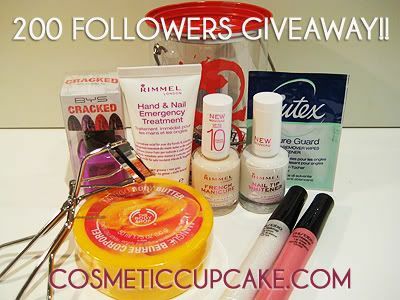 But we mentioned some great giveaways, and we're back now - today I'm going to post a how-to. Enjoy!